New features and tools have been added to the translation center powered by ProZ.com and made available to ProZ.com Business members. A new channel has been added to the translation center for communications with the site administrators. This new Contact us! feature, accessible from the top Support menu option, will be visible to all the players, including non-logged in visitors. This will close a communications gap in the platform, as there were dedicated channels for issues related to jobs, invitations and assignments, but no messages were possible outside these areas. In particular, there were no ways of communication open to non-logged-in visitors. A CAPTCHA feature has provided in this case to prevent the misuse of this feature by automatic spammer devices. It will be possible to reply directly via email to the messages received through this new channel. As part of a general overhaul of the translation center’s notifications and invitations, a new ‘Administration’ → ‘Settings’ → ‘Notifications’ page displays several of the messages currently available, with an explanation and a preview feature for each one. In particular, the invitations sent to service providers can now be edited to better adapt them to the needs of the company managing the translation center. To this end, an edit feature has been added, together with the ability to restore the original version in case of need. This page will evolve to include all the notifications in the system, taking into account the many valuable requests for improvements received. Some of the notifications will be editable, and in some cases their use will be personalizable. When a message sent through the translation center has an attached file, it is now possible to download the file directly from the corresponding notification email. It is now possible to store default instructions that will be presented as a template each time work order is created, while retaining the ability to overwrite them if needed. The translation center powered by ProZ.com is used by Translators without Borders and several commercial translation companies to deliver millions of translated words every month. This platform is made available to all ProZ.com Business members. If you want to learn more about this platform, please submit a support request. The translation center will let you define the clients on whose behalf the useful work is done on the platform. Clients in these pages are just information in the database, but it is also possible to invite representatives, called client contacts, for one, several or all your clients, with a configurable level of access. A setting parameter will let you define the client visibility towards service providers. Depending on this setting, the identity of the client will be visible or invisible to the providers working on a job. Several standard fields are provided for the client contact information, and you can add any number of custom fields for additional data on the client. Default to members of a team: When a job for this client is created, the team selected in this setting will be the default choice of providers, but it will be possible to overrule this setting. Force members of a team: the selected team will be invited to the job. The last option is useful in cases where you let the client contacts create a work order, but you want complete control on the providers invited to the corresponding jobs. There are a couple of cost-effective tools for uploading reference information to be later assigned to several jobs. Projects can be associated to one or more work orders, and you can use them to post instructions that will be entered once for the project and then will be displayed in all jobs created for the client that are associated with the project. Client files can also be upload for the client, and then be automatically presented as reference information in all jobs created for the client. Each file can be associated with a category (glossary, reference, style, TM and other). Client contacts are actual people who are optionally invited to the translation center in order to represent a client in the platform. Messages can now be posted from a work order or a job, addressed to all players or to administrators or even to individual translators. You can also filter the messages exchanged based on their visibility. It is also possible to reply to messages directly from the “last messages” tab in the dashboard, including the messages posted by translators from the page where jobs are offered to them. Several improvements were introduced to the pages used for inviting and assigning translators to accept a posted job, including a more intuitive navigation among them. 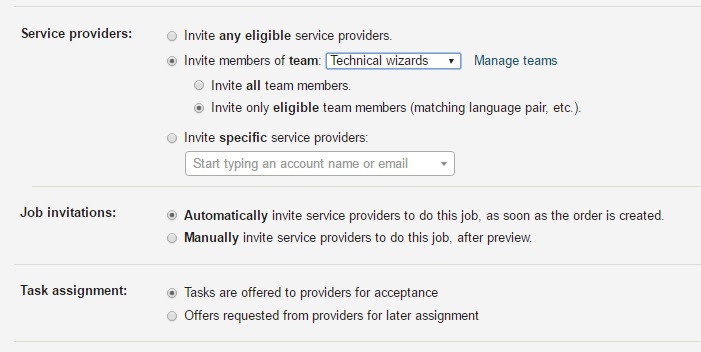 When a team or a set of providers are picked for the queue of a job, all other eligible providers can now be added to the queue, in case the originally selected translators did not accept the invitations. You can have invitations sent manually to this team, selecting how many invitations should be sent at time and the minutes between batches of invitations. Translators can also be manually invited from the pool. You can modify the order of translators in that pool by clicking and dragging their names up or down, send messages to translators, manually add or remove translators to the list of candidates for invitation and even deactivate an invitation already sent. Invited translators will access a page where they will have access to the available information and will be able to exchange messages with the job posters. Depending on the configuration selected when the job was created, invited translators will be able to directly accept a task, or the assignment will be manually done by the job posters (generally based on the messages received from the invited translators). Teams are a powerful feature in the translation center, that lets you group your service providers in accordance to whatever criteria you select, in such a way that any service provider can be in none, one or many teams. Whatever is needed for your operation. It is now possible to associate a client with a given team, either as a preset value or as a forced option, so that when a PM (or even a contact from the client) creates a work order, the translators contacted will belong to the team pre-selected for the client in particular. It is now possible to upload files of up to 25 MB, up from a previous 10 MB limit. Instructions can now be posted in projects, work orders and jobs, and they will be also presented to translators in the page where the assignments are offered to them. Providers are now presented in a tabular format, alphabetically sorted, with page sizes of 15, 50 or 100 translators per page. A link to the translators’ ProZ.com profile is provided. Two important features have been added to the translation center powered by ProZ.com and made available to ProZ.com Business members. 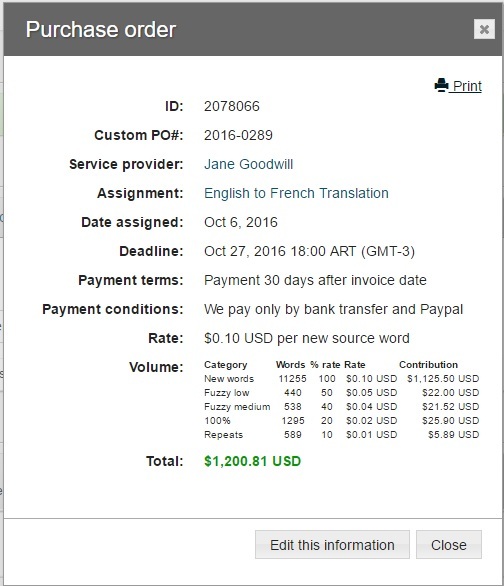 The translation center now includes the tools needed for you to assign a purchase order to each task in the translation center. These purchase orders can then, once the corresponding tasks have been completed, be used by the service providers to submit you the corresponding invoices through the system. The company can them approve or reject invoices, keep track of the accounts payable, mark invoices as paid and be notified of late payments. Information on rate, units, volume and total amount, selected when the PO is created. Units can be selected as source or target words, source or target lines, pages, hours and minutes. It is also possible to import an SDL Trados analysis, as displayed below. The Finance → Purchase orders menu option will present to the service providers all the purchase orders associated with tasks assigned to them, with information that includes PO number, date of assignment, scope, assignment status, invoice (when issued) and associated amount. There are menus for searching among the POs and also to locate assigned tasks that do not have a complete PO associated with them. When used by the company that manages the translation center, this option will present the same information for all service providers that have or had tasks assigned to them. The Finance → Invoices menu option will present to the service providers all the invoices they submitted through the system, including the invoice number, due date, included POs, approval status, payment status and money amount. There is a tool for searching invoices and a button to submit an invoice. This last tool will enable the association of several POs in a single invoice, provided that all are expressed in the same currency and have the same payment terms. A due date will be automatically calculated. The service provider will also be able to submit an actual invoice in digital format. When used by the company managing the translation center, this option will present the same information for all service providers. In this case there are no provisions for the creation of an invoice. By opening the page corresponding to any invoice it will be possible to edit the approval status (approve, edit, reject) and to mark it as paid. In none of these cases was it possible for service providers to communicate with the job poster, and this translated in an operation with little flexibility and that had to rely on communications managed outside the platform. The first condition corresponds to the current situation, where any invited service provider will be able to accept a task. This is the best alternative when you have a tight deadline and want the file accepted as soon as possible. The second option is totally new. Instead of an acceptance button, the invited service providers will be only able to post messages (for instance letting you know about their availability and interest) and you will be able to manually assign any of the tasks to any of your qualified service providers. In both cases invited translators will be able to communicate with you even when they have still no task assigned (this is also new) and you will be able to post messages visible to all invited translators or to any particular provider, and to follow a conversation as seen by any of the invited translators. If you are a ProZ.com Business member, or consider becoming one, and want to learn more about the translation center powered by ProZ.com, please contact me via email or submit a support request. Early this year, the ProZ.com team was proud to announce the release of a new ProZ.com Mobile app for Android. Since then, the app has had over 3,000 users performing more that 60,000 job actions, posting more than 3,000 votes on Quick Polls, setting their availability to take on new projects in real time and more. On September 30th, ProZ.com celebrated International Translation Day by making ProZ.com Mobile available on iOS, in Beta stage and free of charge to ProZ.com members (see the forum announcement →). Are you a ProZ.com member? Download the app today, login using your existing ProZ.com account and continue getting the most out of ProZ.com anytime, anywhere! Thanks to all members for making ProZ.com Mobile possible with your membership investment.